On May 27, 1938, the Silly Symphony Wynken, Blyken and Nod was released to theaters. 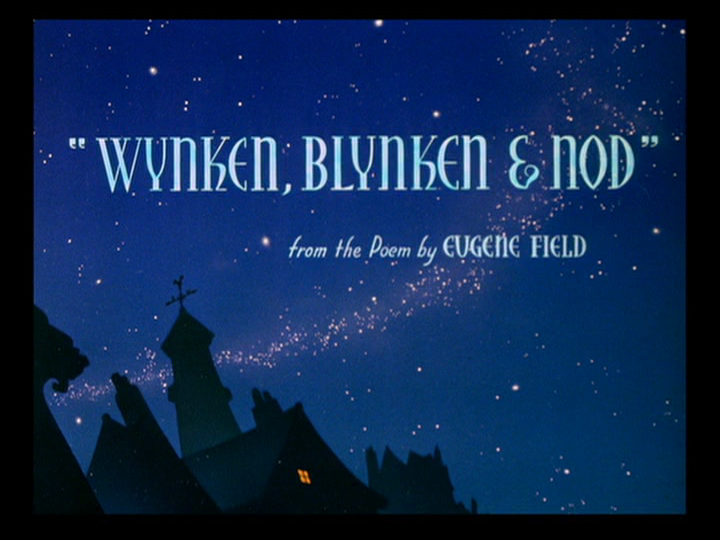 It was based on the poem by American poet Eugene Field, originally titled Dutch Lullaby. The short was directed by Graham Heid. One starry night, Wynken, Blynken, and Nod sail across the sky in a ship made out of a wooden clog, setting out their fishing lines over the side. The ship lands in a cloud, and the three tots step out to push the ship back into the sky. They spot an area filled with star fish, and set about to catch a few, although it is much more trouble than they expected. The fish manage to outsmart the boys, and poor Nod is thrown over the side of the ship. A shooting star heads their way, scattering the fish and scaring the boys. They manage to hook their net over the shooting star, which carries them quickly across the sky. A group of black clouds send the ship flying across the storm, with the ship’s sail tearing in two before the mast breaks off. The boys tumble from the sky and back into a bedroom on Earth, revealing that the three are all aspects of a sleeping toddler.